Melt is a curious cookbook. While Stephanie Stiavetti and Garrett McCord are not the first to explore comforting combinations of noodles and cheese, the authors have taken the pairing to a whole new level. That approach works out very nicely for a curious cook like me. Disclosure: I received a complimentary copy of Melt from the publisher (Little, Brown and Company) in hopes that I would review it here. Additionally, I am acquainted with both of the authors. Nevertheless, this post is my original writing and the views expressed here are entirely my own. This is a big book. You might enjoy having it out on your coffee table as much as in your kitchen. It’s full of ideas that take mac and cheese to new lengths and heights. While singing the praises of an American favorite, the book is as valuable as a treatise on artisan cheeses as it is on pairing them with pasta. After an introduction by Michael Ruhlman (Michael Ruhlman! ), the book opens by explaining the basics of cheese—everything from how it’s made to purchasing, storing, and of course shredding to get your mac on. There’s even a recipe for making your own paneer. Sprinkled throughout the book are additional cheese lessons and lore. 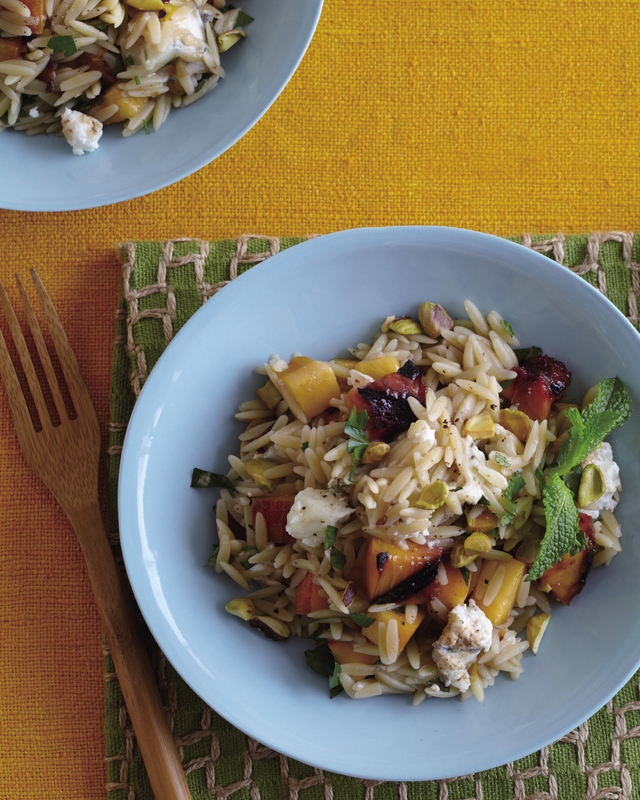 The recipe chapters cover “refreshing” combinations (largely pasta salads), and the very first one caught my eye: Humboldt Fog with Grilled Peaches and Orzo (recipe below). I’m not sure I can wait for Valentine’s Day to try out the Chocolate Pasta with Bucherondin, Hazelnuts, and Cherries. Already you can see that this is no ordinary mac and cheese collection. Additional chapters cover Stovetop Delights, Hearty and Satisfying (casseroles and other baked concoctions), and a few dessert options. A Cheese Compendium spreading two pages charts out name, milk type, country of origin, and cheese type for the majority of cheeses mentioned in the book, and a Pasta Guide will clear up your questions about pasta types you may not know, like pizzichi and idiyappam. Melt creatively interprets the term “macaroni and cheese.” Calling it “the art of” seems appropriate. The recipes include lots of great suggestions for substitutions, including alternate cheeses, additional pairings for the cheese used, and wine pairings. The recipe headnotes and other narrative are enticingly conversational, which seems perfect for a food most of us grew to love in childhood. At times it’s downright irreverent. It makes the book approachable, entertaining, and though some of the recipes run long and have many ingredients, Stiavetti and McCord always keep them approachable. Mac and cheese is meant to be an indulgence, but some recipes are loaded with obscene amounts of butterfat and other-fat. It’s an outlier, but one recipe includes three sticks of butter, a pound of cheese, and a pound of prosciutto for a recipe serving four. Some of the recipes stretch the definition of mac and cheese a bit too far. Is a chicken breast stuffed with cheese and macaroni really mac and cheese? Tomato soup with star pasta served with cheese crisps? Udon with radicchio topped with grated cheese? On that last point, I don’t suppose I have a leg to stand on, having recently written a book that suggests scooping ice cream into a hot dog bun, dousing it with toppings, and tackling it as an ice cream sandwich. And really, how can you fault the authors for being creative, especially when they’ve presented the book more as art than taxonomy. Still, be prepared to think b-r-o-a-d-l-y when you open this book. 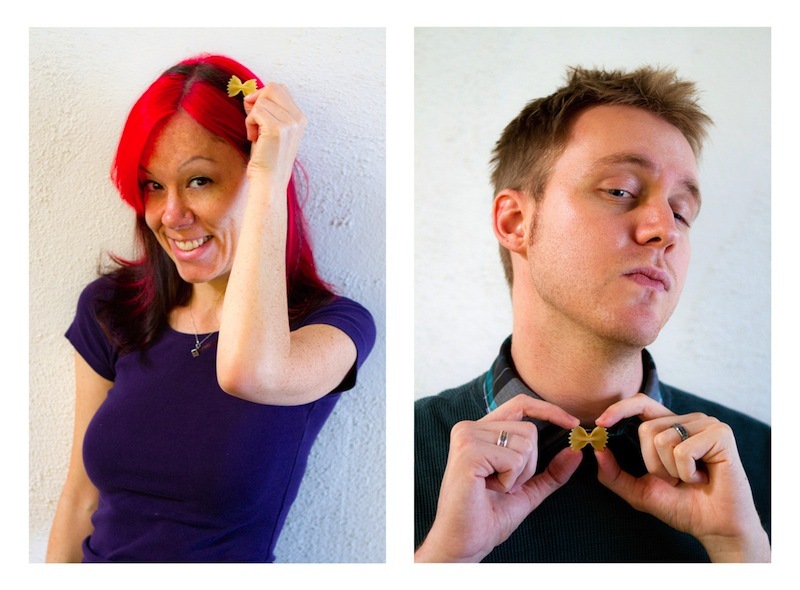 Want your own peek at Melt? Check out this trailer. And while you’re there, browse the Melt website for more information about the book and promotional events. What’s your favorite pairing of pasta and cheese? 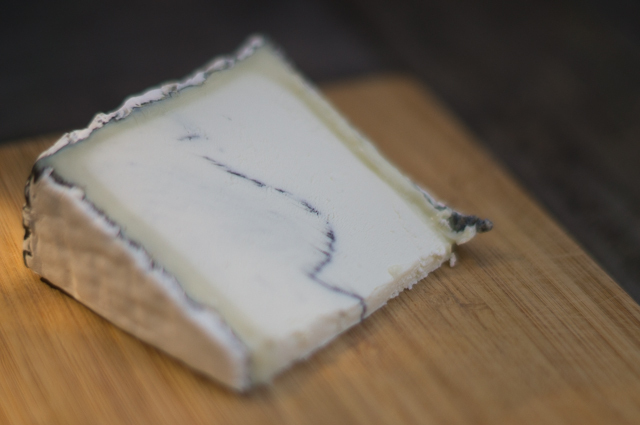 In their book Melt, Stiavetti and McCord feature summer in a bowl with grilled peaches, their ideal match for Humboldt Fog, the vegetable ash-ribboned goat cheese from Cypress Grove Chêvre in Humboldt, California. I’ve adapted the recipe for Fall, substituting grilled figs for the peaches, which perfectly complemented the olive oil, balsamic, and tangy cheese. In the heartier spirit of autumn, I used whole wheat orzo from Rustichella d’Abruzzo. I also tossed in some beautifully ripe blackberries before serving. To make the recipe as in the book, substitute three freestone yellow peaches for the figs, wiping off the fuzz with a damp paper towel before cutting them in half lengthwise and removing the pits. The authors toss the fruit with the dressing in a zip-top bag; because they are delicate, I’ve used a bowl for the figs. 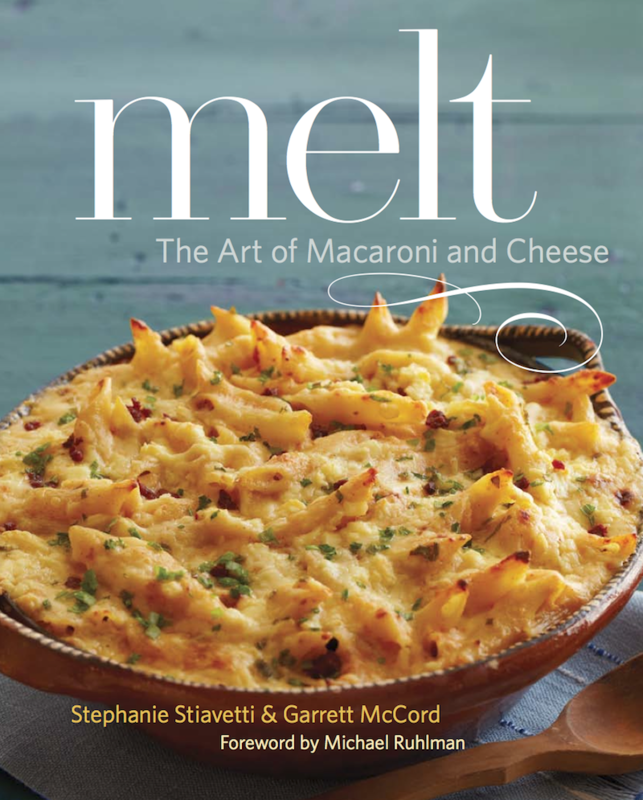 Author: Adapted by Jennie Schacht from Melt: The Art of Macaroni and Cheese, by Stephanie Stiavetti and Garrett McCord. Recipe courtesy of Little, Brown and Company. Wipe the figs with a damp cloth if needed, then remove the stems and cut the figs in half top to bottom. Mix together the honey, balsamic, and oil, and a pinch of salt in a bowl. Add the fig pieces, gently spoon the sauce over them to coat, and let stand for 10 minutes. While the figs marinate, cook the orzo according to package directions until al dente. Drain and set aside. Cook for 5 to 8 minutes, until they begin to developed grill marks. Roughly cut the figs into bite-sized pieces and set aside. Combine the figs, orzo, parsley, mint, pistachios, and reserved marinade in a bowl. Gently toss to evenly coat the orzo, adding salt and freshly ground black pepper to taste. Break up the Humboldt Fog and add to the bowl. Love this Jennie! Gorgeous shot of the cheese!!! Thanks, Jane. Humboldt Fog is tasty stuff! Went very well with the figs, too. It was entirely my pleasure!